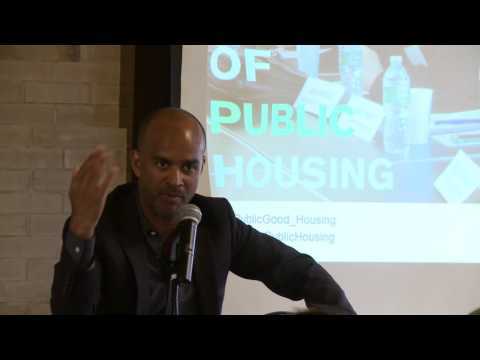 "The Future of Public Housing" Roundtable convened practitioners and public housing residents to discuss the future of housing as an infrastructure which demands greater allocation of public resources. The conversation built upon the objectives of the National Public Housing Museum’s US premiere presentation of House Housing: An Untimely History of Architecture and Real Estate. The House Housing research project encourages historically informed public conversation—such as this roundtable—about the intersection of architecture and real estate development. Strategies and actions on the table engaged current public housing residents, scholars, policymakers and practitioners while galvanizing and educating allies in the general public. Jacob Moore, Co-curator of House Housing, Temple Hoyne Buell Center for the Study of American Architecture, Columbia University. Moderated by Nadine Maleh, Executive Director, Institute of Public Architecture.